As you can see, just about every element of a modern IT is portrayed. Down at the base of the pyramid, you got your storage. IOPS, RAID, rotational & ssd, snapshots, dedupes, inline compression, site to site storage replication, clones and oh me oh my…all the things we really really love are right here. It’s the Luntastic layer and always will be. Above that, your compute & Memory. The denser the better, 2U Pizza Boxes don’t grow on trees and the business isn’t going to shell out more $$$ if you get it wrong. Above that, we have what my networking friends would call the “Underlay network.” Right. Some cat 6, twinax, fiber, whatever. This is where we push some packets, whether to our storage from our compute, northbound out to the world, southbound & down the stack, or east/west across it. Leafs, spines, encapsulation, control & data planes, it’s all here. And going higher -still in Infrastructure Land mind you- we have the virtualization layer. Yeah baby. This is what it’s all about, this is the layer that saved my career in IT and made things interesting again. This layer is designed to abstract all that is beneath it with two goals in mind: cost savings via efficiency gains & ease of provisioning/use. And boy,has this layer changed the game, hasn’t it? So if you’re a virtualization engineer like I am, maybe this is all you care about. I wouldn’t blame you. The infrastructure layer is, after all, the best part of the stack, the only part of the stack that can claim to be #Glorious. But in my career, I always get roped in (willingly or not) into the upper layers of the stack. And so that is where I shall take you, if you let me. Next up, the Platform layer. This is the layer where that special DBA in your life likes to live. He optimizes his query plans atop your Infrastructure layer, and though he is old-school in the ways of storage, he’s learned to trust you and your fancy QoS .vhdxs, or your incredibly awesome DRS fault-tolerant vCPUs. Or maybe you don’t have a DBA in your Valentine’s card rotation. Maybe this is the layer at which the devs in your life, whether they are running Eclipse or Visual Studio, make your life hell. They’re always asking for more x (x= memory, storage, compute, IP), and though they’re highly-technical folks, their eyes kind of glaze over when you bring up NVGRE or VXLAN or Converged/Distributed Switching or whatever tech you heart at the layer below. Then again, maybe you work in this layer. Maybe you’re responsible for building & maintaining session virtualization tech like RDS or XenApp, or maybe you maintain file shares, web farms, or something else. Point is, the people at this layer are platform builders. To borrow from the automotive industry, platform guys build the car that travels on the road infrastructure guys build. It does no good for either of us if the road is bumpy or the car isn’t reliable, does it? The user doesn’t distinguish between ‘road’ and ‘car’, do they? They just blame IT. Next up: software & service layer. Our users exist here, and so do we. Maybe for you this layer is about supporting & deploying Android & iPhone handsets and thinking about MDM. Or maybe you spend your day supporting old-school fat client applications, or pushing them out. And finally, now we arrive to the top of the pyramid. User-space. The business. This is where (and the metaphor really fits, doesn’t it?) the rubber meets the road ladies and gentlemen. 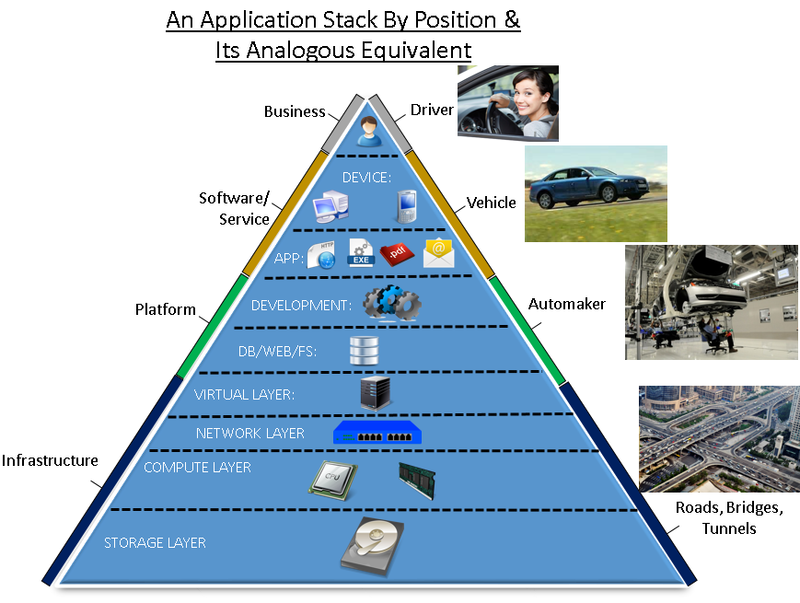 It’s where the business user drives the car (platform) on the road (infrastructure). This is where we sink or swim, where wins are tallied and heros made, or careers are shattered and the cycle of failure>begets>blame>begets>fear>begets failure begins in earnest. That’s the stack. And if you’re in IT, you’re in some part of that stack, whether you know it or not. But the stack is changing. I made a silly graphic for that too. Maybe tomorrow.